Our new Colombia tour is designed to compliment our main Colombia Andean Classic tour by focussing on the Mitu/Amazon area and the Magdalena Valley. Both of these areas will offer us a very different set of birds with plenty more endemics and localised specialities. We will spend the first day at some sites around Bogota looking for species such as Bogota Rail, Rusty-breasted Antpitta, Apical Flycatcher, Apolinar’s Wren, Rosy Thrush-Tanager and others. The next day we will take a short flight to Mitú in Vaupés, which is one of the least developed departments in Colombia and is the best place in the Colombian Amazon for birdwatching. We will be based in Mitú where a variety of ecosystems can be found ranging from varzea and white sand forest, to rivers and primary forest. Mitú is THE place to find most of the Colombian Amazon species and where mouth-watering highlights could include the stunning Chestnut-crested and White-plumed Antbirds, Orinoco Piculet, Tawny-tufted Toucanet, Bronzy Jacamar, Pompadour Cotinga, Imeri Warbling Antbird and Azure-naped Jay. There are so many birds to see here and we are sure to have an amazing time. We will have 5 nights here and ample time to thoroughly explore this seldom-visited region. The second half of our tour is based at several locations in the Magdalena Valley where we will visit six different departments: Cundinamarca, Tolima, Caldas, Antioquia, Boyacá and Santander. Habitats here range from premontane forest, dry forest, tropical humid forest, karstic tropical forest, savannas, wetlands, coffee and cocoa plantation areas. Our route around the Magdalena Valley should give us a further 20 endemic species and many more near-endemics, rare and localised birds. 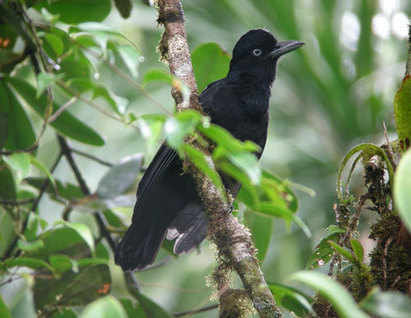 We will visit a number of private reserves and other hotspots in our search for Blue-billed Curassow, Colombian Chachalaca, Tolima Dove, Beautiful Woodpecker, Andean Blossomcrown, Black Inca, White-mantled Barbet, Moustached Puffbird, Magdalena and Parker’s Antbirds, Chestnut-capped Piha, Stiles’s Tapaculo, Sooty Ant-Tanager, Red-bellied Grackle and many more! Everywhere we go you will be amazed at the sheer number and variety of birds present and with almost 1900 species, Colombia has the biggest birdlist of any country. This tour will fill in those gaps on your Colombia list and leave you longing to return! Group size: Minimum for tour to go ahead 4 and maximum 9. Included in cost: Accommodation in rooms, mostly en-suite, all meals from dinner on Day 1 to breakfast on Day 19, all transportation within Colombia, domestic flights, a variety of vehicles including 4x4’s, all reserve entrance and land owners fees, bottled water and services of leaders and local guides. Accommodation: Our hotels and lodges vary in quality but all are within easy reach of the areas we wish to bird and some are inside the reserves. Most of them have private bathrooms but at some lodges, electricity is only available for a few hours in the evening via generator. Hot water may not be available at some lodges, and you will find showers are set at 'tropical temperature'. Tour Code: This is a standard birding tour with all day birding. To see a good amount of endemics and specialities you need to be prepared for full days, so we will generally start early and either have an early breakfast or return for breakfast. Lunches will be either picnic or at the lodge depending on our schedule. We can expect all types of weathers from warm and hot to cool and showery, so please be prepared for this. The elevations during the tour vary from 300m to 2600m. As the tour will take part from the end of August to the beginning of September there may be some rain in some areas. Our morning flight to Mitú on Day 3 only allows 15k check-in baggage and 5kg hand luggage, so you can leave luggage at the hotel in Bogotá and pick it up when we return on day 7. The trail at the Chestnut-capped Piha Reserve goes uphill and can be a little strenuous, whilst the stony path at the Cerulean Warbler reserve can be slippery. Trails near Rio Claro can also be slippery and steep.